An unusual infrared light emission from a nearby neutron star detected by NASA's Hubble Space Telescope could indicate new features never before seen. This illustration shows a neutron star (RX J0806.4-4123) with a disk of warm dust that produces an infrared signature as detected by NASA's Hubble Space Telescope. The disk wasn't directly photographed, but one way to explain the data is by hypothesizing a disk structure that could be 18 billion miles across. The disk would be made up of material falling back onto the neutron star after the supernova explosion that created the stellar remnant. An unusual infrared light emission from a nearby neutron star detected by NASA's Hubble Space Telescope could indicate new features never before seen. One possibility is that there is a dusty disk surrounding the neutron star; another is that there is an energetic wind coming off the object and slamming into gas in interstellar space the neutron star is plowing through. Although neutron stars are generally studied in radio and high-energy emissions, such as X-rays, this study demonstrates that new and interesting information about neutron stars can also be gained by studying them in infrared light, say researchers. The observation, by a team of researchers at Pennsylvania State University, University Park, Pennsylvania; Sabanci University, Istanbul, Turkey; and the University of Arizona, Tucson, Arizona, could help astronomers better understand the evolution of neutron stars -- the incredibly dense remnants after a massive star explodes as a supernova. Neutron stars are also called pulsars because their very fast rotation (typically fractions of a second, in this case 11 seconds) causes time-variable emission from light-emitting regions. A paper describing the research and two possible explanations for the unusual finding appears Sept. 17, 2018, in the Astrophysical Journal. "This particular neutron star belongs to a group of seven nearby X-ray pulsars -- nicknamed 'the Magnificent Seven' -- that are hotter than they ought to be considering their ages and available energy reservoir provided by the loss of rotation energy," said Bettina Posselt, associate research professor of astronomy and astrophysics at Pennsylvania State and the lead author of the paper. "We observed an extended area of infrared emissions around this neutron star -- named RX J0806.4-4123 -- the total size of which translates into about 200 astronomical units (approximately 18 billion miles) at the assumed distance of the pulsar." This is the first neutron star in which an extended signal has been seen only in infrared light. The researchers suggest two possibilities that could explain the extended infrared signal seen by Hubble. The first is that there is a disk of material -- possibly mostly dust -- surrounding the pulsar. 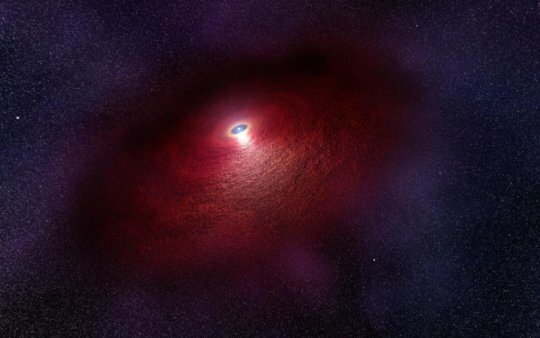 "One theory is that there could be what is known as a 'fallback disk' of material that coalesced around the neutron star after the supernova," said Posselt. "Such a disk would be composed of matter from the progenitor massive star. Its subsequent interaction with the neutron star could have heated the pulsar and slowed its rotation. If confirmed as a supernova fallback disk, this result could change our general understanding of neutron star evolution." The second possible explanation for the extended infrared emission from this neutron star is a "pulsar wind nebula." "A pulsar wind nebula would require that the neutron star exhibits a pulsar wind," said Posselt. "A pulsar wind can be produced when particles are accelerated in the electrical field that is produced by the fast rotation of a neutron star with a strong magnetic field. As the neutron star travels through the interstellar medium at greater than the speed of sound, a shock can form where the interstellar medium and the pulsar wind interact. The shocked particles would then emit synchrotron radiation, causing the extended infrared signal that we see. Typically, pulsar wind nebulae are seen in X-rays and an infrared-only pulsar wind nebula would be very unusual and exciting." Using NASA's upcoming James Webb Space Telescope, astronomers will be able to further explore this newly opened discovery space in the infrared to better understand neutron star evolution.